Learning a complex new language is no easy task especially when it s an object-oriented computer programming language like Java. You might think the problem is your brain. It seems to have a mind of its own, a mind that doesn't always want to take in the dry, technical stuff you're forced to study. The fact is your brain craves novelty. It's constantly searching, scanning, waiting for something unusual to happen. After all, that's the way it was built to help you stay alive. It takes all the routine, ordinary, dull stuff and filters it to the background so it won't interfere with your brain's real work--recording things that matter. How does your brain know what matters? It's like the creators of the Head First approach say, suppose you're out for a hike and a tiger jumps in front of you, what happens in your brain? Neurons fire. Emotions crank up. Chemicals surge. That's how your brain knows. And that's how your brain will learn Java. 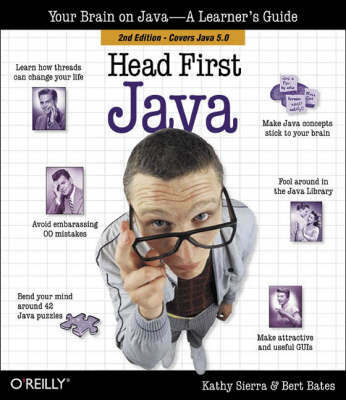 Head First Java combines puzzles, strong visuals, mysteries, and soul-searching interviews with famous Java objects to engage you in many different ways. It's fast, it's fun, and its effective. And, despite its playful appearance, Head First Java is serious stuff: a complete introduction to object-oriented programming and Java. You'll learn everything from the fundamentals to advanced topics, including threads, network sockets, and distributed programming with RMI. And the new. second edition focuses on Java 5.0, the latest version of the Java language and development platform. Because Java 5.0 is a major update to the platform, with deep, code-level changes, even more careful study and implementation is required. So learning the Head First way is more important than ever. If you've read a Head First book, you know what to expect--a visually rich format designed for the way your brain works. If you haven't, you're in for a treat. You'll see why people say it's unlike any other Java book you've ever read. By exploiting how your brain works, Head First Java compresses the time it takes to learn and retain--complex information. Its unique approach not only shows you what you need to know about Java syntax, it teaches you to think like a Java programmer. If you want to be bored, buy some other book. But if you want to understand Java, this book's for you.